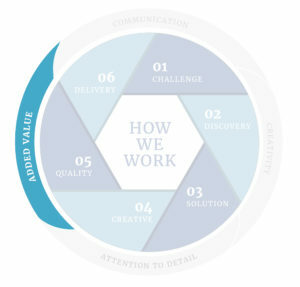 At Ballyhoo our work is built on four fundamental principles that drive all of our projects and partnerships. Added Value is one of the principles that supports each step in our storytelling process. You may ask “What does Added Value mean?” Often people think of it only as additional cost savings or pricing discounts. While financial value is something that Ballyhoo can bring to the table, we look at Added Value on a deeper level. It’s capturing those intangible details of a project that help us clear your plate for the mission critical work. At Ballyhoo each project is a collaboration with our clients and your organization that YOU can be proud of. We’re able to provide tools you can use to be successful creating visual storytelling, creative content and memorable experiences. Any agency can give you a graphic, a brochure, or a presentation that checks off your list of must have’s. That’s not how we work at Ballyhoo. We sit with you to learn your project requirements and then dig deeper. Why are you working on this project? How does it tie to other pieces of your strategic communications plan? Do you even have a strategic communications plan? When we have these conversations with our partners it always leads to a deeper understanding of their needs and the solutions they are truly looking for. Often, the solution they thought they wanted isn’t the right fit at all. and increases staff capacity by having them focus on mission critical work. The overall cost savings and increased production afforded an organization is the Added Value that Ballyhoo brings to clients large and small and across the globe. Are you looking to bring Added Value to your communications strategy? Let’s talk!